Design the outdoors with this contemporary sectional set by Sonax. 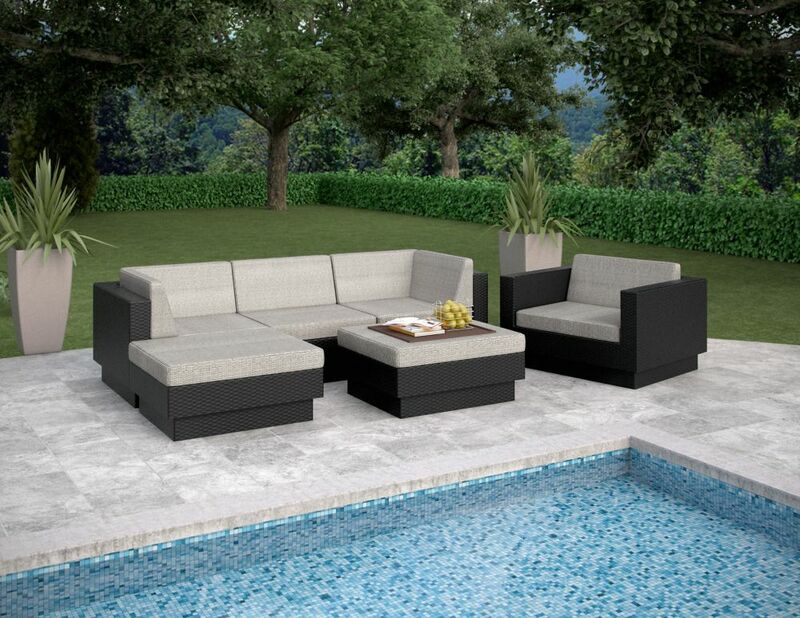 Featured in our Textured Black Weave and accented with Salt and Pepper coloured cushions this versatile set is perfect for all of your summer entertaining. Made with UV resistant Resin Rattan Wicker, water repellent cushions and a durable aluminum alloy frame this product is ready to withstand the elements of the outdoors. Configure this set to suit your needs or transform the cozy ottoman into a modern coffee table. You decide! This complete 6 piece blue sectional patio sofa set will create an intimate backyard space that you and your friends will love. Meticulously constructed with an aluminum frame, a variegated grey woven base, UV weather resistant fabric and materials makes it easy to care for and a joy to own. Design the outdoors with this contemporary Square Sectional with Chaise Lounge & Chair Patio Set by CorLiving. Featured in our Textured Black Weave and accented with Dove Grey cushions this versatile set is perfect for all of your summer entertaining. Made with UV resistant resin rattan wicker, water repellent cushions and a durable steel frame this product is ready to withstand the elements of the outdoors. Transform the configuration to suit your needs. Park Terrace 6-Piece Double Armrest Sectional Patio Set in Textured Black Design the outdoors with this contemporary sectional set by Sonax. Featured in our Textured Black Weave and accented with Salt and Pepper coloured cushions this versatile set is perfect for all of your summer entertaining. Made with UV resistant Resin Rattan Wicker, water repellent cushions and a durable aluminum alloy frame this product is ready to withstand the elements of the outdoors. Configure this set to suit your needs or transform the cozy ottoman into a modern coffee table. You decide!